A friend of the blog passed along an intriguing link the other day. A post on ReadingRockets.org raised a serious question about the legitimacy of using certain puzzles as teaching tools. No educational value? Are they kidding? Now, I admit that the concern for puzzles to be used as time-fillers instead of teaching tools is a fair one. But to dismiss them entirely is a bit premature, especially when you’re considering the potential for elementary school-age students. Obviously, both crosswords and word searches have vocabulary-building aspects, but that ignores the true potential each puzzle adds to an educational environment. Let’s start with word searches. Properly employed, word searches can be marvelous tools for pattern recognition and efficient problem solving. For instance, imagine giving a class a particular word to find amidst a field of options. Instead of “passively locating words”, as one commenter noted, they’re left to devise their own method for quickly and efficiently locating a word with eight possible orientations. Do they scan top to bottom, or left to right for the first letter, or an uncommon letter? Do they rely on certain vowel or consonant combinations that might jump out at them? How a student solves a given puzzle can give insight into how they tackle other challenges. Beyond this, I think they’re ignoring a simple fact regarding word search solving: the further you get into the solve, the harder the grid is to read. Seriously. If you’re halfway through a word list, your grid is full of lines and circles distracting you from the other words in the grid. Those pattern recognition skills I mentioned earlier become even more important. And what do crosswords bring to the table? Plenty. 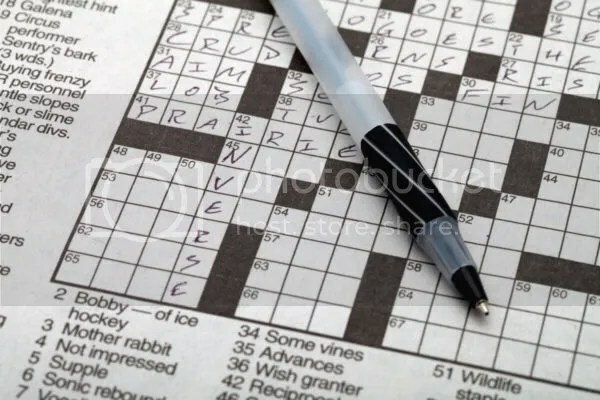 Crosswords foster both a familiarity with wordplay and deductive reasoning. Solvers unravel puns and riddles, encounter synonyms and antonyms, as well as puzzling out answers from letters provided by crossing entries. People who write off crosswords as too trivia-heavy are ignoring a field of puzzles that not only challenge cultural and historical knowledge, but pop culture, sports, and language. Plus, can anyone deny the sense of accomplishment that comes with completing a crossword? Anything can be a time filler when improperly employed. But puzzles are not only non-intrusive ways of introducing new words to a student, they’re exercises in efficiency and problem solving. This entry was posted in PuzzleNation, Puzzles and tagged Classic Word Search, crosswords, education, Geeking Out, iBook, opinion, PuzzleNation, Puzzlin' fool, reading rockets by gmdirect. Bookmark the permalink. I completely agree with everything you say here!